100 point is $1. 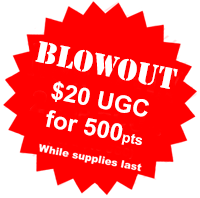 Earn only 800 points to get your free $10 Ultimate Game Card. And they let you paypal the difference if you don't have enough.